I'm almost disgusted with myself for taking so long to get a real, proper gadget up on GavsWorld! I've had PDAs since about 2002, when I bought a Palm m505, moving quickly onto the Palm Tungsten C which had Wi-Fi built in. I rapidly grew out of favour with the Palm devices - not because they were bad devices, but because they were very limited in what they were capable of - and also most software had to be purchased! 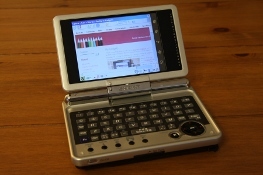 So, the next upgrade was to basically a clam shell pocket sized computer: the Sharp Zaurus SL-C860 (code named Boxer). This is a very small PC that runs a fully blown Linux installation! How good is that?!?! Anyway after a year or so, I upgraded to this, the Sharp Zaurus SL-C3200 (code named Terrier). Main differences between this and the 860 were a faster processor, more RAM, more FLASH and a built in Hitachi micro-drive (a hard drive the same size of a compact FLASH card!) Both of these were Japan only models, so I had to import them especially. As it turns out, this was the last Zaurus model that Sharp ever produced which was a damn shame (although they've recently brought out something similar, the Netwalker PC-Z1 - which is more powerful and runs Ubuntu but unfortunately not available in the UK either). What does the Zaurus do? Well you've got the obvious Personal Information Management (PIM) tools - like a calendar, address book, to-do lists etc. But on top of that, how about an e-mail client, Opera web browser, instant messenger, word processor, spreadsheet, remote computer access, secure shell, X-Windows, ftp, Wi-Fi sniffer, Quake ... the list goes on! I keep ending back on Cacko which is an English translation of the Japanese Sharp ROM - so everything "just works" ... however it is a static distribution with no development. The others are more active, however since they are reverse engineering some of the Sharp hardware, they're perhaps not the most feature rich. They're still worth a wee play though!